The work of Claude Lefort highlights one of the paradoxes of the Marxist tradition. Despite its claim to be the theory of the revolutionary proletariat, developing dialectically with the advances of the working class, a specifically Marxist approach to sociology and political theory was never developed. This might result from the ‘traditional’ structure of these disciplines, whose aim is prediction and manipulation of human objects. While the Institute for Social Research set itself the task of filling this lack (including in every issue extensive book reviews of contemporary empirical research), the political theory that would have been necessary to fuse its philosophical self-understanding with its empirical concerns was never developed, cut short by the development of what its leaders called the ‘authoritarian state’, fascism. 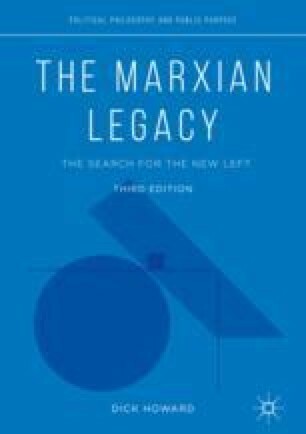 What remained was the assumption that classical Marxism provides a theory of the inherently contradictory and exploitative nature of the societal infrastructure, leaving the contemporary theorist with the task of elaborating the more or less independent tensions in the superstructure.